Bebe Daniels and Gloria Swanson impressed their fans with their previously unrealized singing abilities in talkies. Joan Crawford was game and MGM provided her with a good song for her film, POSSESSED (1931). I converted it to CD-R a long time ago, but I used to have an entire LP of Crawford “singing”. It is a chronological survey of every song from all her movies. Wherever she did not use her own voice, the various dubbers sing. It also includes several of her private home recordings. Fascinating stuff. Joanie had what they used to call "moxie," a drive to try new things for her career. Singing is a good example. Even after she was an established star, she wanted to have a broader range than just acting to the camera. When she was married to Franchot Tone, he persuaded her to do live radio before a studio audience to give her experience with reactions from an audience. She made several mid and late 30s appearances on Lux Radio Theater, sometimes co-starring Tone, where it was said her hands were shaking as she held her script. Her first appearance was in July 1936 just after De Mille had taken over as host. She and Tone performed an adaptation of her film CHAINED. In May 1937 she returned to Lux with Tone at her side to play the Katharine Hepburn role in MARY OF SCOTLAND, stepping out a bit from her comfort level. In Feb 1938 she tackled ANNA CHRISTIE with Spencer Tracy, and was back in June in a non-movie role, Ibsen's A DOLL'S HOUSE, with Basil Rathbone, of all people. All these shows can be heard for free online. Rehearsals were intensive for the Lux broadcasts extending an entire week before the show and studios were known to push their stars into appearing to promote their newest films. Joanie seems to have ended her Lux appearances after A DOLL'S HOUSE perhaps having obtained the audience experience she wanted and sparing herself further stage fright. But like her singing, she was up for the challenge. 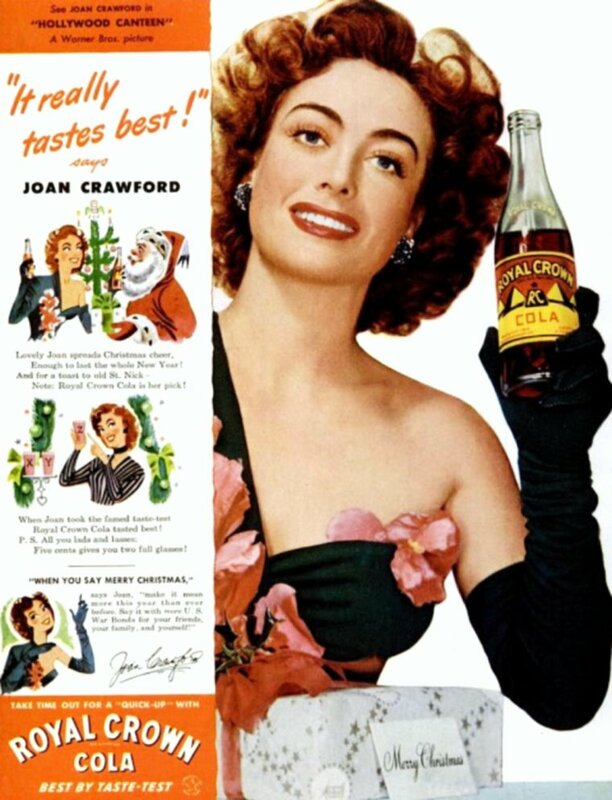 Joanie had what they used to call "moxie,"
But then she had Royal Crown Cola, before she finally settled for Pepsi. There are several stories of why the radio "cage" frame around the mic came into being; one is that Jack Barrymore was just too physical at mic, and another is that La Crawford needed the thing to steady her and keep her in proper range. At any event, she did do more broadcast work after the '38 LUX, including series like SUSPENSE and SCREEN GUILD THEATER.